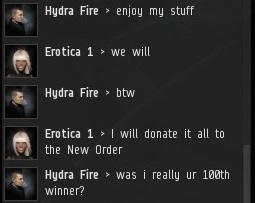 Previously, on MinerBumping... Hydra Fire won a chance to play a special bonus round with prominent Jita businesswoman Erotica 1. 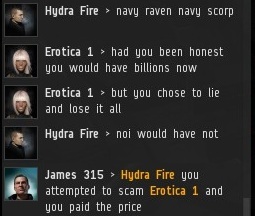 All that was required was for Hydra to put total faith in Erotica, transferring all of his assets to me (as escrow agent) and being completely honest. He sent me his stuff, and everything looked good. 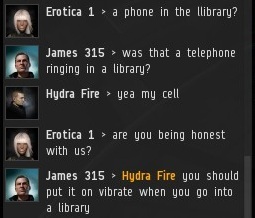 But as Erotica put 25 billion isk into the trade window and prepared to give Hydra the big payday, a ringing telephone could be heard over TeamSpeak. Everyone in the bonus room was stunned. 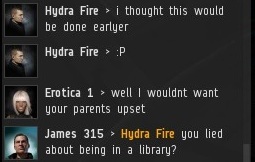 Had Hydra lied about being in public, in a library? Hydra claimed it was his cell phone, but it sure didn't sound like it. Hydra broke down under intense questioning: It was all a lie. He was actually at home. The reason he sang "I'm A Little Teapot" and "Love Potion Number 9" in such a hushed voice was to avoid alerting his parents. It had nothing at all to do with being courteous to his fellow library patrons. I couldn't believe Hydra could be so reckless. Just moments earlier, he seemed on the level. Now it all had to be called into question. Hydra attempted to spin it, but there was no denying that he had lied about being in public. The outcome of the 25 billion isk bonus game was now in jeopardy. We investigated further. 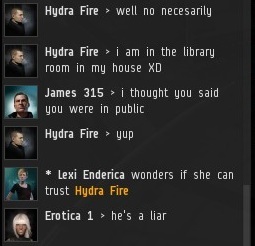 Hydra now admitted that he hadn't put his faith in Erotica. He was willing to give up all of his in-game possessions, but he suspected it of being a scam all along. 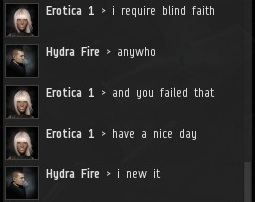 Hydra had officially broken the rules. 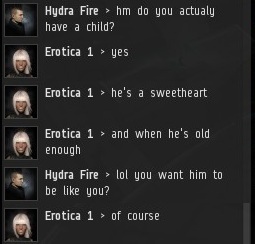 Erotica quickly aborted the 25 billion isk trade window he had opened with Hydra. Surprisingly, Hydra did not offer any apology. He appeared totally unrepentant about trying to scam Erotica with his lies. As the escrow agent, I held all of Hydra's assets in trust. Since Hydra failed the bonus game, these items belonged to Erotica 1. She told me that I should consider the properties a donation to the New Order, so I held onto everything. No one could argue that the result was unfair. But Hydra began to reveal that he harbored all kinds of dark suspicions about Erotica. So much for "total faith". Then Hydra dropped another bombshell. He claimed that he had lied about transferring all of his assets to Hydra. So either he was lying then (and had deliberately broken the rules of the bonus game), or he really hadn't kept assets on an alt, and was lying now. Just as we got to the bottom of one of Hydra's lies, another lie popped up in its place. I was heartbroken. Was this the same guy that I had spent over an hour chatting with on the internet? Did I ever really know him at all? "you know why you placed this corp at risk use your head think a little plus you said you wanted to be a pirate not our think here these guys i have been flying with for 4 yrs we work together as a team we take care of each other no room for loners here have fun fly safe enjoy the game"
"hey ren i believe one of your rules was no scamming. i would like to ask that that rule be revoked. podding i understand because they have no power. but scamming is the persons fault for not looking. im only talking about under 300 mill isk. but anyways if we can talk about it that would be great :)." 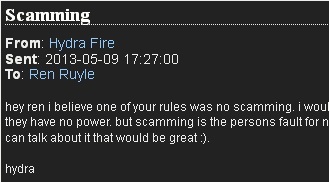 So Hydra was a scammer all along. He attempted to cheat Erotica's bonus game by lying and not putting total faith in her. Who knows how many others he scammed or attempted to scam before all this took place? I was left with more questions than answers. Did Hydra really have a store of expensive assets squirreled away on an alt? And was there anything he could do to convince Erotica to return his assets and award the 25 billion isk bonus prize? One of the reason miners buy permits from the new order is honesty. He was NEVER going to get his 25b or assets back. This is going to severely hurt our credibility as the new order and is going to hurt Erotica's busyness as she scammed him over trivial details. I'm with Agent Trask in this, how do you mean, "our credibility?" If so, I'll explain the situation to you: James 315 was only involved in this situation as a trusted third party. He did everything he was asked to do and more. He went above and beyond the call of duty in this situation. There is no credibility being questioned. The only credibility that was hurt was that of Hydra Fire for being dishonest. I suspect that you are not, in fact, an Agent of the New Order of Highsec but I am willing to be proven wrong. ledrian saisama, is that you? Post under your player name if you claim to be in the New Order. You are being dishonest otherwise. 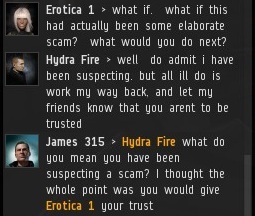 Hydra1 told several lies during the game, and had a past history as a scanner. 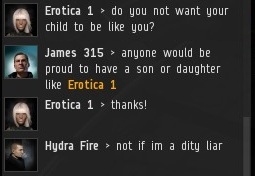 Giving him any ISK back would have been a completely dishonest act by James315 ... which is why he did not do so, and sent the ISK to Erotica1, as he agreed to do in the event of Hydra1's failure to follow the rules. 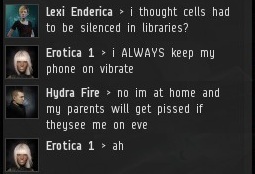 How can we expect miners to follow the rules of highsec if we cannot also enforce the rules to Erotica1's game when asked to do so? learn to thread and people might take you seriously. The New Order doesn't have any credibility so I wouldn't worry about any damage to it. As for giving back the isk. Anyone dealing with the New Order should get their just desserts and then some. Sit down Agent Trask the New Order has never been able to enforce any rule to highsec miners. The New Order kind of remind me of a Big Issue salesman with them trying to sell their permits. Bumping is a non issue for me as is suicide ganking. I've got to admit I feel a bit neglected by the New Order. But they are only a tiny minority whose influence doesn't extended much beyond this blog so I forgive them. Perhaps you've missed the kills NO has distributed amongst those miners who would rather not buy a 10m isk permit. As far as bumping is concerned, I don't bump; so to be fair I don't know how often that takes place. But, I know it happens more often than ganking as you can bump solo. You can gank solo, but it's much more difficult. Hey Bobbins you remember that 10 Orca kills we got in a day? And the hundreds of permits that have followed from the bumping and KM's? Sounds to me like NO has much more of an influence in-game than you're willing to admit. While I knew he was going to lose everything as soon as I started reading part 1, I'm surprised to see that he actually deserved it. Indeed, the scam was pretty obvious but to my surprise the kid deserved it. I wouldn't even trust 10m to a stranger, let alone 25b. Dense as a brick wall. Good riddance! He has paid the price for his lack of faith! Nothing like a nice serving of Just Desserts. I hope Hydra ate well. Funny how all these people who think they can get rich quick are scam artists. No doubt he is hiding mining equipment on his alts. I bet he hasn't even bought permits. Aren't there some fines he might owe James for lying?